The Angels' decision to be cautious with Griffin Canning following last year's Draft prevented him from making his professional debut in 2017. When he finally got the opportunity Thursday night, it came devoid of any butterflies. "It's just baseball," the club's eighth-ranked prospect said. "Once you get out there, it's just baseball." Canning allowed one hit and a pair of walks while striking out six over four scoreless innings in Class A Advanced Inland Empire's 3-2 Opening Night victory over San Jose at San Manuel Stadium. "Me and Jack Kruger, our catcher, were just really in sync all night," the 21-year-old said. "Really, it was just us working together and sequencing well against these guys." The only hit the right-hander gave up was a ground single through the right side by Bryce Johnson, the first batter of the game. "Base hits are going to happen," Canning said. "But it's important to start that first inning off well and not let that guy score." He rebounded by striking out the side to begin a run of 10 consecutive San Jose batters retired before Frandy De La Rosa and Heath Quinn drew back-to-back walks in the fourth. Canning finished his outing by fanning Giants No. 6 prospect Sandro Fabian. The Angels selected Canning with the 47th overall pick in the second round of last year's Draft. He was a Golden Spikes Award semifinalist as a junior at UCLA after compiling a 2.34 ERA and 140 strikeouts while holding opponents to a .213 average over 119 innings. In three years with the Bruins, Canning amassed a 2.99 ERA, eight complete games, four shutouts and 301 punchouts over 292 innings. Although he was anxious to prove himself after the Draft, Canning was understanding of the team's decision to shut him down last year. "It's what I would have normally done if I was going back for my senior year," he said. "In high school, I had taken a few months off after I had pitched a full season, so I can't say that I wasn't kind of expecting that. I mean, obviously I wanted to go pitch ... but there's a bigger picture to it." The Mission Viejo, California native debuted in front of a large contingent of friends and family. Canning graduated from Santa Margarita Catholic High School, which is less than an hour drive from San Miguel Stadium. "It's been a lot of fun. It was a really good environment," he said. "It was really cool to be able to pitch in front of some friends and family. ... So I'm excited to go hang out with all them." Fourth-ranked prospect Angels Jahmai Jones also made something of a professional debut. He started his first game at second base, recording three assists and committing one error. The 20-year-old walked and scored a run, but was hitless in three at-bats. Giants No. 4 prospect Tyler Beede started for San Jose, allowing a run on one hit and three walks while striking out four over five innings. 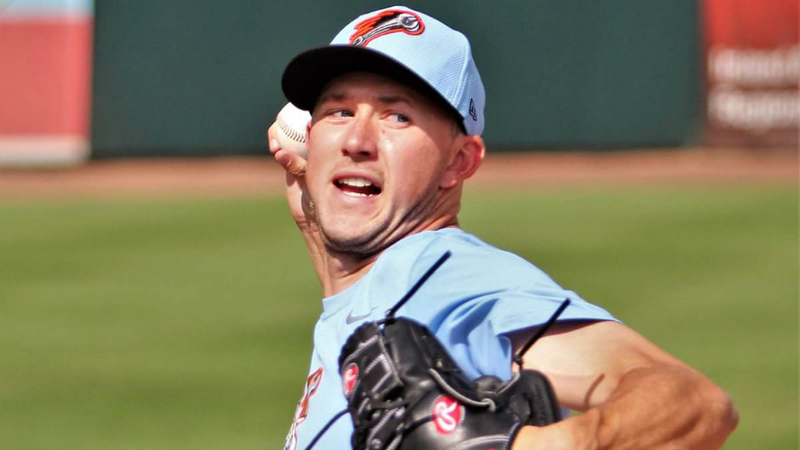 The 24-year-old right-hander will spend the bulk of the season with Triple-A Sacramento but pitched in the California League to avoid the ugly weather forecast for the River Cats opener in Tacoma. Fireballer Melvin Adon, San Francisco's No. 19 prospect, was saddled with the loss after finishing the game for the Giants having allowed two runs on four hits and two walks with six strikeouts over three innings.